This is for 1 factory sealed booster box of YUGIOH DARK SAVIORS FACTORY SEALED BOOSTER BOX UNLIMITED ENGLISH. Condition is New. Shipped with USPS Priority Mail. There are 24 packs per box. Dark Saviors features classic monsters and new deck themes designed to appeal to both new and experienced players. The 60-card set includes vampires that can enslave opposing monsters, skyfaring demihuman swashbucklers, and a heavily-armored heroine equipped with high-tech flying power armor that can be geared up with special weapon modules. The 60 cards in the set includes 40 Super Rares and 20 Secret Rares, and each booster will include five foil cards. Duel Power ’s new cards span the whole history of Yu-Gi-Oh! Start with powered-up versions of your Dark Magician like Magician of Chaos (a new Dark Magician Ritual Monster). Use Cyber Dragon Nachster to power up your most famous Machines from the GX era. 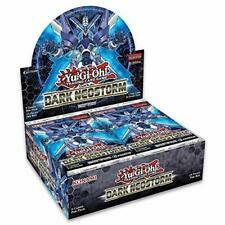 NEW Yugioh Dark Neostorm Booster Box 1st Edition ENGLISH Factory Sealed TCG. These heroes are joined by a mysterious masked Super Quantum pilot clad in white! Heat things up this winter with Savage Strike, the first 100-card 1st edition booster set of 2019! Cybernetic Horizon revitalized Ritual Summoning, and Soul Fusion created powerful Fusion Summoning strategies. 5 out of 5 stars - YuGiOh English Legendary Duelists White Dragon Abyss 1st ed Booster Box SEALED!! 3 product ratings3 product ratings - YuGiOh English Legendary Duelists White Dragon Abyss 1st ed Booster Box SEALED!! No Flaws. Brand New. Game store going out of business. Ask if you have any questions. You are getting 2 Sealed Booster Boxes. 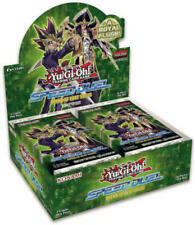 One Duelist Pack Rivals of the Pharaoh AND Star Pack Battle Royal. There are NO RETURNS on any sealed product. No exceptions. This includes this item. These products cannot be opened and returned. Once you purchase, you agree to these terms. I will ship with the greatest of care, wrapped in bubble wrap in a sturdy box. I cannot combine shipping on these items. The boxes are fitted perfectly. If you live outside of the USA, The product will be shipped through the Global Shipping Program, and tracked directly through eBay. YUGIOH SECRETS OF ETERNITY BOOSTERS (1st Edition). The Secrets of Eternity booster set includes 100 cards: 48 Common Cards, 20 Rare Cards, 14 Super Rare Cards, 10 Ultra Rare Cards, and 8 Secret Rare Cards. No matter which Yu-Gi-Oh! Duel Power ’s new cards span the whole history of Yu-Gi-Oh! Start with powered-up versions of your Dark Magician like Magician of Chaos (a new Dark Magician Ritual Monster). Absolute Powerforce Sealed Unlimited Edition Booster Box. Absolute Powerforce features Jack Atlas’ “Majestic Red Dragon” – the latest and greatest upgrade for The Five Dragons. Don’t miss out! In case such thing happened, you will receive full money back. Ancient Prophecy also adds to the XSaber cards introduced in the 2009 Yu-Gi-Oh! Another of the 5 Legendary Dragons resides in Ancient Prophecy; be the first to reveal the force of Luna’s “Ancient Fairy Dragon”! Heat things up this winter withSavage Strike, the first 100-card booster set of 2019! Cybernetic Horizon revitalized Ritual Summoning, and Soul Fusion created powerful Fusion Summoning strategies. Following on from Hidden Summoners and Structure Deck: Zombie Horde,Savage Strike introduces even more Synchro-based Zombie monsters. 1st Edition Battle of Legend: Relentless Revenge Sealed Booster Box. Set: Dragons of Legend 2 (DRL2). Dragons of Legend 2 booster set contains 45 cards Crossed Souls booster set and. ARC-V, the newest generation of the Yu-Gi-Oh! Duelists can finally complete their collection of the Legendary Dragon monsters from the original show withLegendary Knight Critias andLegendary Knight Hermos. Release Year: 2017. Yu-Gi-Oh Dark Saviors. Manufacturer: Konami. Type: Booster Box. Bin Location:WG19C5. Pickup Location. YUGIOH KAIBA'S COLLECTOR BOX. 1 Starter Deck: Kaiba Reloaded. Condition: FACTORY SEALED. Heat things up this winter with Savage Strike, the first 100-card booster set of 2019! Cybernetic Horizon revitalized Ritual Summoning, and Soul Fusion created powerful Fusion Summoning strategies. Synchro Summoning crashes into the VRAINS! Trending at $83.00eBay determines this price through a machine learned model of the product's sale prices within the last 90 days. Introducing Speed Duel: Attack from the Deep booster set! His new Skill Card lets you harness his luck and give you the chance to write your own fate once per Duel. With only one chance to turn a Duel around, Joey always has your back. 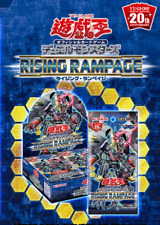 Command the destructive power of "Black Rose Dragon,- the newest of the legendary Dragon Synchro Monsters. More exciting new Synchro monsters are introduced in this 100-card set as well as cards from the all-new Yu-Gi-Oh! Trending at $107.95eBay determines this price through a machine learned model of the product's sale prices within the last 90 days. Link Monsters and the newest changes to the official rules ask you to think about where you play your cards on the field. Code of the Duelist introduces the first new Deck strategies where the position of your cards matters just as much as which cards you play! Gold Series Haunted Mine, Sealed Booster Box . Condition is New. Shipped with USPS Priority Mail. Rise of Destiny, Sealed Booster Box First Edition . Condition is New. Shipped with USPS Priority Mail. ~ Factory Sealed Box ~. 5510 6th Ave Tacoma, WA 98406. Sorry, no SASE's. ZEXAL TV series arc. ~~~~~~~~~~. YUGIOH THE NEW CHALLENGERS - SUPER EDITION. 1st Edition Battle of Legend: Light's Revenge Sealed Booster Box. (LOT OF 3)YUGIOH TCG DUEL POWER BOOSTER SET FACTORY SEALED DISPLAY BOX NEWSealed. Condition is New. Shipped with USPS First Class Package.